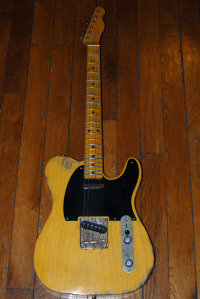 On a glorious 2011 january morning, here it was, the parcel coming from Florida with the precious Rittenhouse Telecaster inside! The relicing job is very well done. It looks and feels old. All my colleagues at work (where I got it shipped) asked me how old was the guitar! Acoustically it is loud and very resonant. The neck is huge, when Abe Rittenhouse says chunky, he MEANS chunky!! You need time to get used to it but I love it. 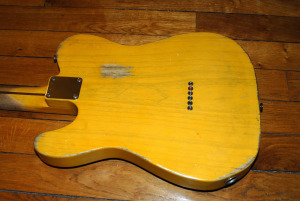 Stay tuned for an upcoming video and audio review of what is now my very personnal Micawber Telecaster replica (even though there is no humbucker in the neck position, it is still the inspiration).